While hybrids grab the headlines with fuel efficiency, they’re not always the most cost-effective solution. If you have a long daily commute that doesn’t include a lot of city driving, you may be better off with a conventionally powered vehicle, such as the 2017 Hyundai Elantra Eco. 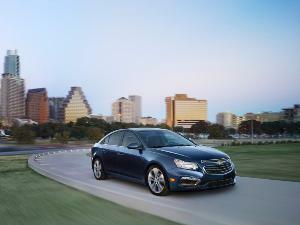 This little gem is one of the most efficient non-hybrid sedans on the road today. There’s a slew of competition in this class. If you’re in the market for a conventionally powered and very efficient sedan, you’ll want to shop the Elantra Eco against the 1.0-liter EcoBoost Ford Focus, Chevrolet Cruze, Scion iA, Toyota Corolla LE Eco, Honda Civic, and the Nissan Versa. 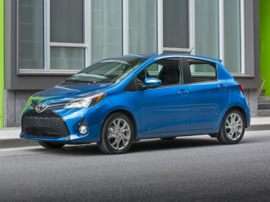 All have EPA combined ratings of 35 MPG or above. 1) It has an efficient drivetrain. 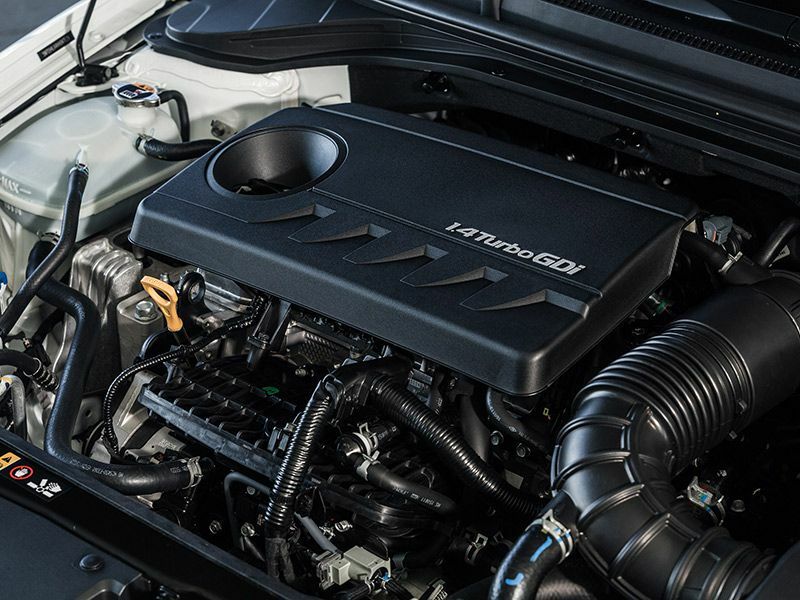 The 2017 Hyundai Elantra Eco is equipped with a turbocharged GDI 1.4-liter inline-4 that produces 128 horsepower and 156 lb.-ft. of torque. The Eco’s tiny turbo four is mated exclusively to a 7-speed dual-clutch automatic transmission. A manual transmission is not offered. This sets the Eco apart from other Elantra models. 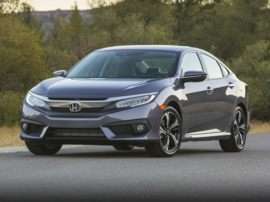 The engine is responsive and the 7-speed DCT delivers quick shifts, although it is notably less smooth than a traditional automatic. 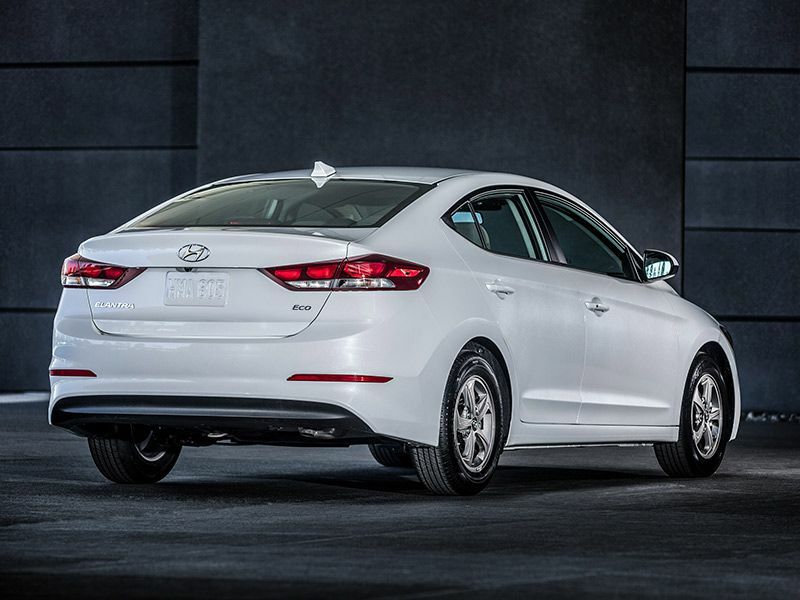 The Eco is positioned between the Base Elantra SE and top-of-the-line Elantra Limited. The Elantra SE and Elantra Limited are fitted with a naturally aspirated 2.0-liter 4-cylinder engine. The SE is equipped with a 6-speed manual as standard equipment, with a 6-speed automatic offered as a $1000 option. 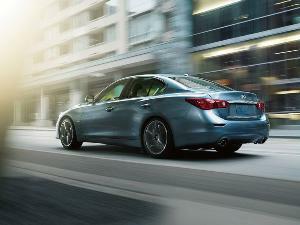 The Limited is only available with the 6-speed automatic. 2) Not a lot of horsepower, but tons of torque. The turbocharged 1.4-liter 2017 Hyundai Elantra Eco is rated by the EPA at 32 MPG city/40 MPG highway/35 MPG combined. I rolled up over 500 miles on the Autobytel test vehicle, which averaged more than 40 MPG with no passengers in mild weather with the air conditioning largely off. By comparison, the naturally aspirated 2.0-liter Elantra SE is rated at 26/36/29 with a 6-speed manual and 29/38/33 with a 6-speed automatic. While the little turbo motor isn’t wicked fast, it’s quite spritely, with the 156 lb-ft. torque peak between 1400 and 3700 RPM. Although 128 horsepower might not seem like a lot, it’s torque that matters, and the Eco has sufficient power on the roll. By our clock, this efficient Hyundai hits 60 MPH in about 8.5 seconds. The Elantra Eco is thoughtfully designed, with tech features that enhance the day-to-day experience. While proximity keys are common these days, the Elantra Eco ups the ante with door handle approach lights. It gets even better when you walk up to the Eco’s hands-free “Smart Trunk” while carrying a bundle groceries (and the key fob). In this instance, the trunk will open itself after three beeps. No other vehicle in the class offers this feature. The Eco’s exterior appearance is similar to that of the base SE. Eco badging, unique 15-inch alloy wheels, and vertical LED daytime running lamps are the points of differentiation. The exterior color palette includes Electric Blue, White, Silver, Beige, Lakeside Blue, Black, Red, and Gray. 4) Superior aerodynamics and efficient tires. 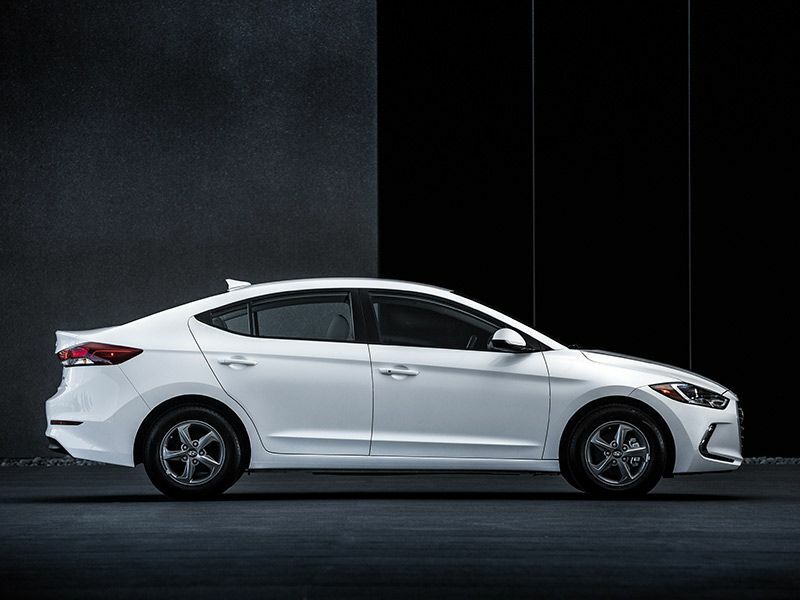 A sleek 0.27 coefficient of drag helps the Hyundai Elantra Eco to be extremely fuel efficient at highway speeds. The front fender introduces a minimal amount of air to the front tire tread, with ingenious ducting that creates an air curtain around the front tires. The extended deck spoiler allows for clean air separation at the rear of the vehicle, and underbody cladding allows air to flow cleanly beneath the vehicle. The Elantra Eco’s aerodynamic 15-inch alloy wheels are wrapped with 195/65-15 low-rolling-resistance tires to further improve fuel economy. Our test car was equipped with Hankook Kinergy GT Grand Touring All-Season tires. Tire Rack lists the Michelin Energy Saver A/S and Nexen R Priz AH8 All-Season tires as OEM alternates. 5) It has an elegant interior. The Elantra Eco’s roomy interior feels like a scaled down version of the Sonata, and that’s a good thing. The heated front seats are supportive and provide six-way power adjustment for the driver and passenger, but they do not offer adjustable lumbar support. The 60/40 split rear seat provides 37.3 inches of headroom, 35.7 inches of legroom, and 55.3 inches of shoulder room. As such, the Elantra Eco is pretty spacious in back, although it does lack a rear center armrest. The leather-wrapped steering wheel provides a full range of controls, and a 3.5-inch monochromatic TFT driver information center provides a wealth of data. The dual-zone automatic climate control includes a CleanAir ionization and Auto Defogging systems. 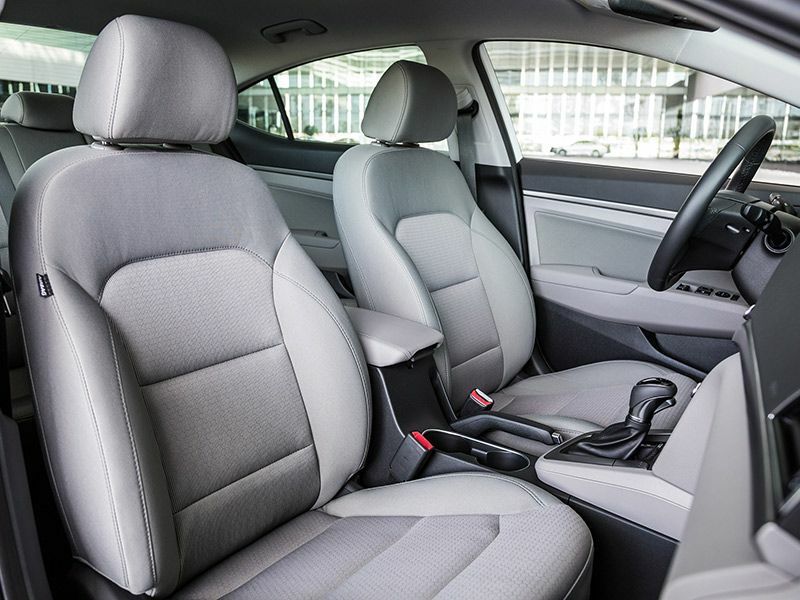 The Limited is the only Elantra trim level to offer leather upholstery and an optional sunroof. 6) It's loaded with safety features. The 2017 Hyundai Elantra scores a Good rating in the Insurance Institute for Highway Safety’s (IIHS) crashworthiness tests and is equipped with seven airbags, including a driver’s knee airbag and side and rear curtain airbags. A Rearview Camera with Dynamic Guidelines—together with Blind-Spot Mirrors, Rear Cross-Traffic Alert, and Lane Change Assist—is standard. 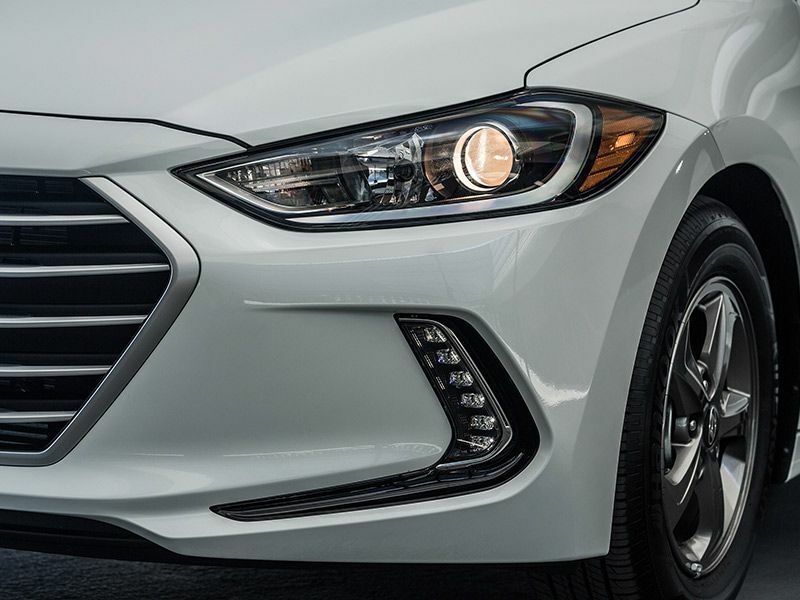 The Elantra Limited earns an IIHS Top Safety Pick+ award when equipped with the optional Tech and Ultimate option packages, but these packages are not offered in the Elantra Eco. 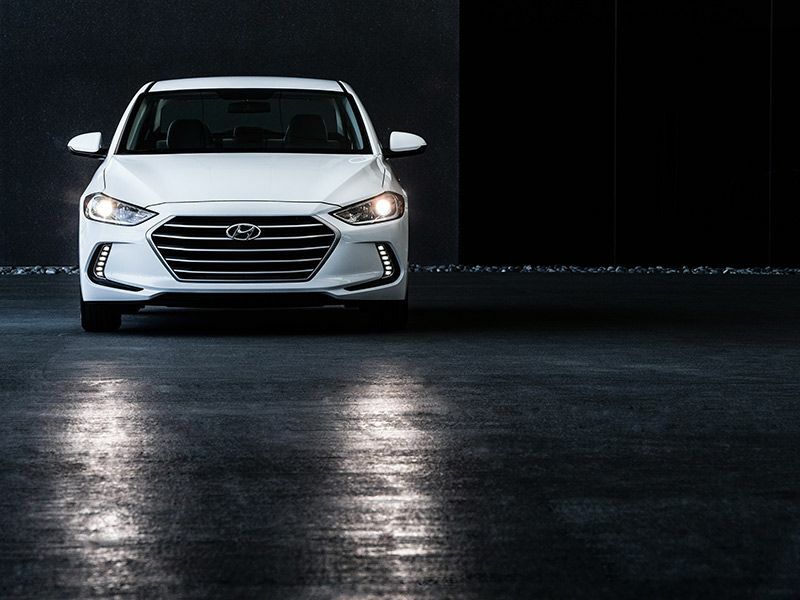 If you want an Elantra with Automatic Emergency Braking, Front Adaptive Cruise Control, Lane Departure Warning, Lane Keep Assist, and Automatic High Beam Assist, you’ll need to step up to the Limited trim level. The 2017 Toyota Corolla ups the ante by offering many of these technologies as standard equipment. 7) Navigation depends on your having a smart phone. 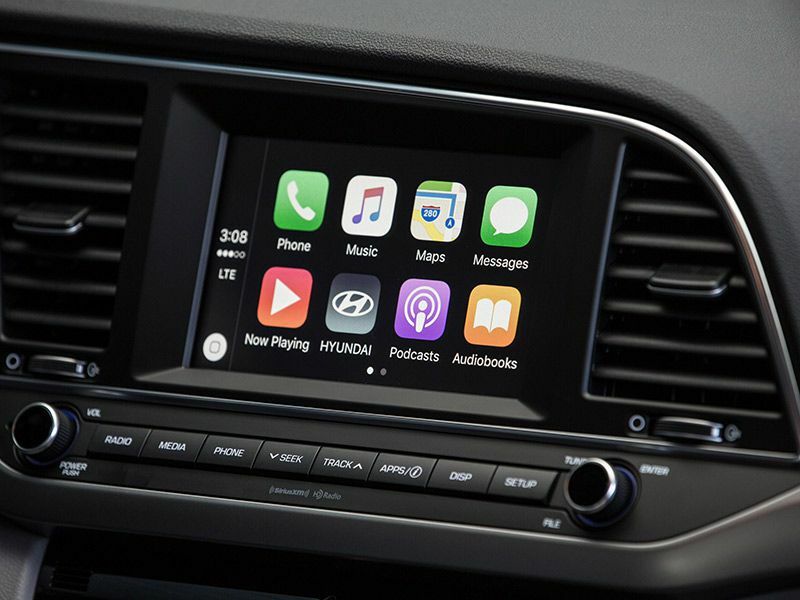 The Elantra Eco’s standard 7-inch touchscreen infotainment system supports Apple CarPlay and Android Auto, but lacks a built-in navigation system option. If you have a smartphone, you’re in luck. If not, you’ll need to add an external navigation device. Apple CarPlay and Android Auto are the slickest and safest ways to interface with your phone while on the go. Voice commands make it easy to deal with text messages while keeping your eyes on the road. The audio system is equipped with six door-mounted speakers, including tweeters in the front doors. There is no factory upgrade path. If you crave a subwoofer, you’ll have to visit your local audio shop. A complimentary three-month SiriusXM satellite radio subscription is included, but does not include SiriusXM Data Services. 8) It's takes you on a relaxing, smooth ride. If you’re looking for a relaxing and affordable long-distance commuter, you’ve come to the right place. The Elantra Eco delivers a smooth and composed ride. The cabin is wonderfully quiet at highway speeds and changing the character of the car is as easy as pushing a button on the center console. There are three driving modes: Normal, Eco, and Sport. Eco mode may save a bit of fuel in town, but didn’t make much of difference on the highway. Normal mode steering feedback is a bit soft, but not overly so. Sport mode tightens up the steering nicely, quickens throttle response, and allows the engine to wind out a bit. The DCT transmission can be a bit clunky at slower speeds. 9) Good value for the money. The 2017 Hyundai Elantra Eco has an MSRP of $20,650. 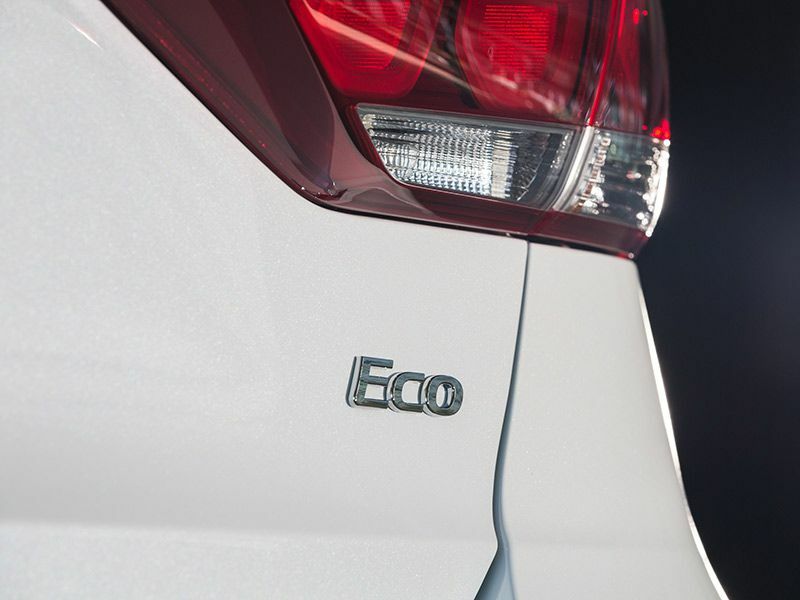 The Eco is a monospec trim level. While no option packages are currently offered, there are a handful of dealer-installed options and accessories, including ambient interior lighting ($250) and an Auto-Dimming Mirror with HomeLink and BlueLink ($295). The Eco is better value than a loaded SE. 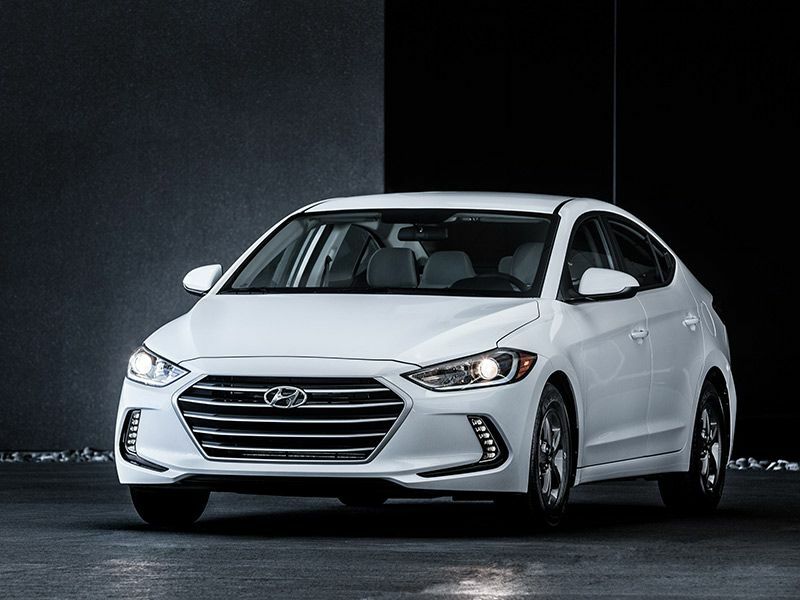 If you add the automatic transmission ($1000) along with the Popular Equipment option package ($800) and Tech Package ($1300) to the Elantra SE’s starting MSRP of $17,985, the bottom line rises to $21,850, eclipsing the Eco’s price by $1200. While the Elantra Limited’s starting MSRP of $22,350 takes a significant leap when you add the Tech Limited ($2500) and Ultimate Limited ($1900) option packages, it still offers solid value. 10) That great Hyundai warranty applies.